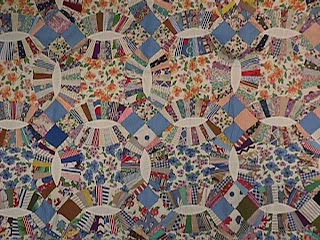 One quilt pattern, the Double Wedding Ring, really took quilters' imaginations in the 1930s. Mountain Mist, a batting company, even printed it inside their quilt batting paper wrappers. The pattern was so unusual and challenging that many folks rose to the occasion, including one farm wife in Ottumwa, Iowa. I was teaching in Ottumwa and during downtime after class, strolled the local flea market and discovered this absolutely scrappy Double Wedding Ring quilt top. I can imagine the lady now, unrolling her quilt batting and discovering this novel quilt pattern. She evidently couldn't afford the six yards of white fabric recommended in the pattern so she improvised--with feedsacks! I love this piece. You can sense the quiltmaker's determination-" I am going to make this quilt, even if I have to use every scrap of fabric in the house!" If 'Ottumwa' sounds familiar, remember it was Radar O'Reilly's hometown on the TV program Mash. You can be ticking right along with someone, admiring her flower garden, her herb garden, her vegetable garden and her clothesline, praise her canning room and drop to your knees when you see her gold-painted meditation room adorned with only a mat, a candle and her yogi’s photo. You’ll be nattering along with a farmer about how his yield was last year when he’s interrupted by a phone call from a stock broker in Japan. Someone says, ‘Let’s get together for a wine dinner this weekend,’ and afterwards the elementary special ed teacher host and her bus driving hubby say bathing suits in the hot tub are optional. Who knew Iowa was such a wild state?